The U.S. Department of Health and Human Services has listed March as National Endometriosis Awareness Month. Let us continue to help educate the world about the realities of Endometriosis! Let’s fight for more humane care and treatment! They have a petition that you can sign, saying you really want this stamp in circulation – Sign the Petition today! Fellow endometriosis blogger Jeanne writes, “Approximately 5.5 million women and girls in North America have endometriosis. An estimated 89 million worldwide have it. Yet it remains “under-the-radar”. The general public is largely unaware of it or misunderstand how debilitating it can be.”Please sign her petition to Create Endometriosis Awareness & Understanding. Be sure to also check out Jeanne’s blog for more ways to get involved!! Encourage conversation about Endometriosis with this lovely totebag! 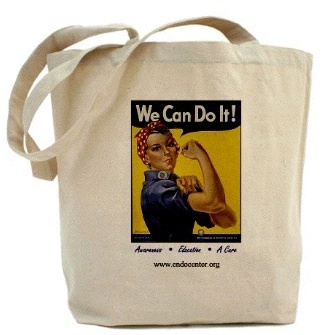 Below the Rosie the Riveter image, it reads, “Awareness, Education, A Cure.” This bag comes from the Endometriosis Research Center’s (ERC) online store. Buying one or more of these bags not only helps the environment, because you’re cutting down on usage of paper and plastic bags at the grocery, but it also helps the ERC in their endo research, enriches their programs and of course, helps others learn about endometriosis! 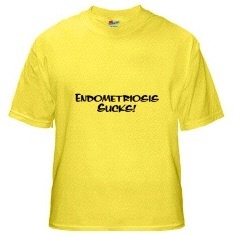 Another way to strike up conversation about Endometriosis, and with a bright yellow shirt to boot! More at the But You Don’t Look Sick store! Check out all the ways you can help out the Endometriosis Association in their Millennium Campaign for the Cure! Let’s make March a productive month and get the masses more educated about Endometriosis!